The backbone of our beef program has been USDA Prime since we opened more than 35 years ago. Why? That’s because Prime is the highest grade the USDA grants, and they grant it to less than 2% of the beef produced in the United States. The beef that earns this Prime designation has the highest ratio of marbling, enhancing the finished steak’s flavor and tenderness. All our USDA Prime beef comes from an exclusive partnership with Double R Ranch, located on 70,000 breathtaking acres in the Okanogan region of northern Washington State. The mild climate, open spaces, and the abundance of natural resources provide for cattle health and comfort. Their family ranchers Kent & Lana Clark know that if you are good stewards of your land and cattle, you’ll end up producing exceptional beef. I’ve tasted Prime beef from all over the country and this is the best beef available hands down, which happens to be in our own back yard. We then custom dry-age our Double R Ranch Prime Beef to enhance the flavor and tenderness of each steak. 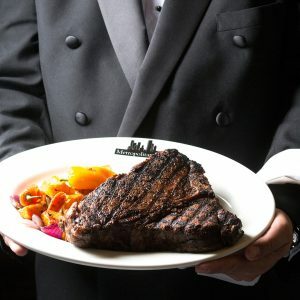 When asked what my ideal steak of choice would be, I often end up choosing Metropolitan Grill’s Prime Delmonico, a bone-in New York strip from the short loin. This steaks’ intense flavor and tender texture has a slightly meatier chew near the bone. In my book, that variety makes for the quintessential American steak experience—the kind of experience that can only begin with USDA Prime. The Delmonico is in good company on our menu, featuring other classics we’ve built our reputation on; dry-aged USDA Prime filet mignon, New York strip loin, top sirloin, Porterhouse, ribeye, bone-in filet mignon—even a Chateaubriand for two, carved tableside. Come in and taste for yourself.